1) Tell us a little about your business – what you do and who do you do it for? I am a wedding planner based in Arkansas, although I do travel to various destinations as well. My clientele is engaged couples! I love working with people during the most special times of their lives. It is an absolute dream to be a part of someone’s journey in this way. Often it feels like working with a best friend and some clients truly make me feel like I have become part of their family. I offer three packages: wedding day management, virtual wedding planning and full planning and design. I have packages for any budget because every couple deserves to feel relaxed and taken care of on one of the most important days of their lives. 2) What’s one piece of advice you would go back and tell yourself when you were first starting your business? 3) What has been your favorite Styled Stock Society collection thus far? It is very hard to decide on one because I use a little from each! I will say, when the Dusty Rose + Merlot came out I was “ooh-ing and ahh-ing.” The colors are absolutely gorgeous together and I used a couple on my website. A close second would have to be the Make a Plan collection, of course! 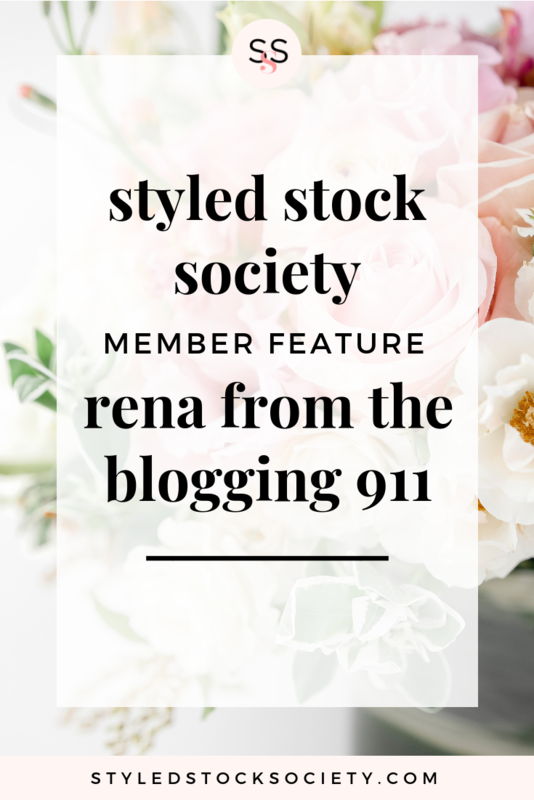 4) How being a Styled Stock Society member has made your life easier? Becoming a member has made my life SO much easier. I used to source stock images from multiple places, but it was hard to find exactly what I needed and took up way too much of my time. 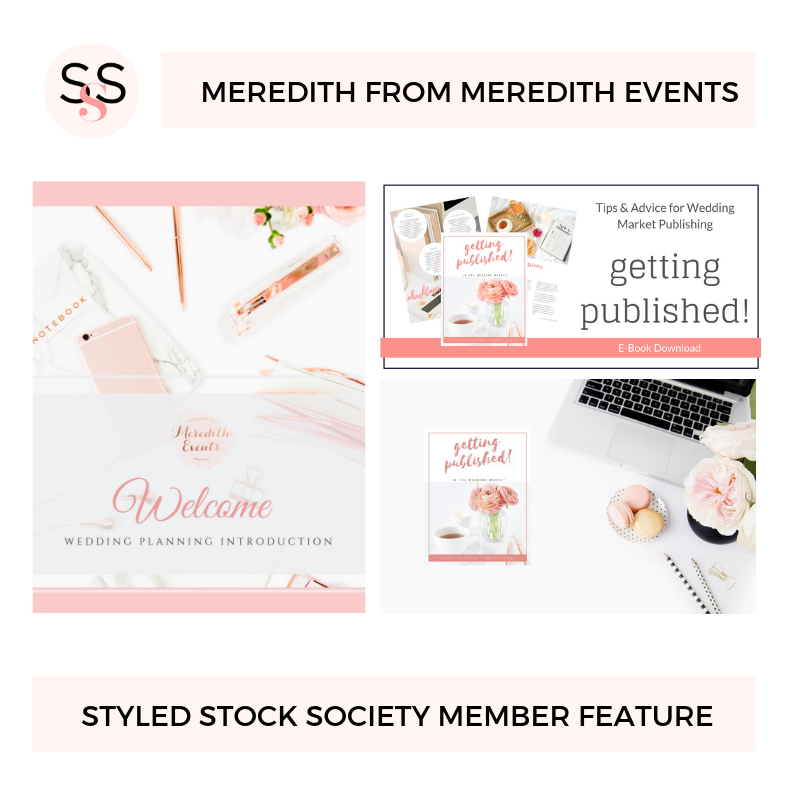 Styled Stock Society always has something I need for any project I am working on. It flows beautifully with my branding and although the collections are different themes and colors, there is a cohesiveness that runs through all the collections. Enlist help! When I started my business, I tried to do everything all on my own, such as things like my web design (terrible idea!) I was hesitant to spend money at first, but I eventually learned it was easier to hire others for certain things or take courses to learn quickly from the experts. I love pink everything and use it in my branding, so I love the Blush Pink Office collection. In general, I love all of the pretty pink collections since I’m a totally girly girl! As I mentioned above, outsourcing has been a game changer for me. I continue to work my day job along with my business, so saving time is really important for me. I’m also a new mom, so time is even tighter now. I used to take my own photos for instagram, but have been struggling to find the time. 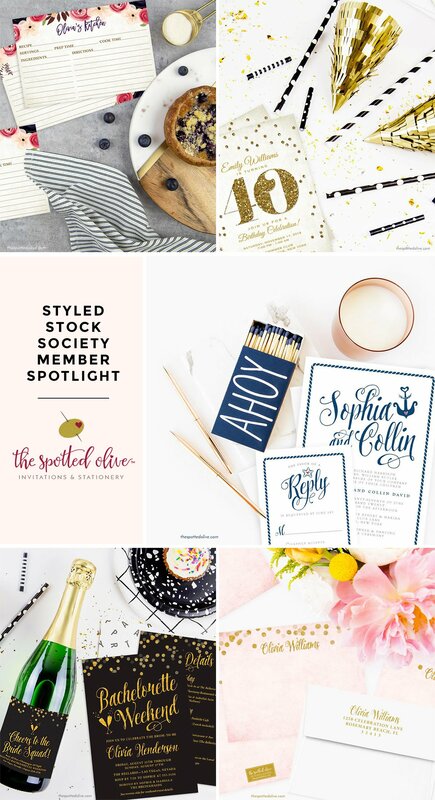 Using the Styled Stock Society photos has given me a beautiful Instagram feed in waaaay less time! 1) Tell us a little about your business. What you do and who you do it for? My name is Rena and I help empower women to become the entrepreneur they’ve always wanted by connecting all of the technology needed to power their online business. I specialize in helping midlife women who are wanting to build a business in the second chapter of their lives. I’m a web designer who loves to tackle technology and make it work for you the way you need it to work. 2) What’s one piece of advice you would give someone else who is just starting their own business? I would say to really narrow down who you want to work with because life is short & I only want to work with clients who are as excited as I am to take this journey. If you’ve seen The Blogging 911 it’s a total nod to feminism with lots of pinks and golds, but the dusty rose collection I think is going to be one of my favorites. I also loved the Candy Crush collection. 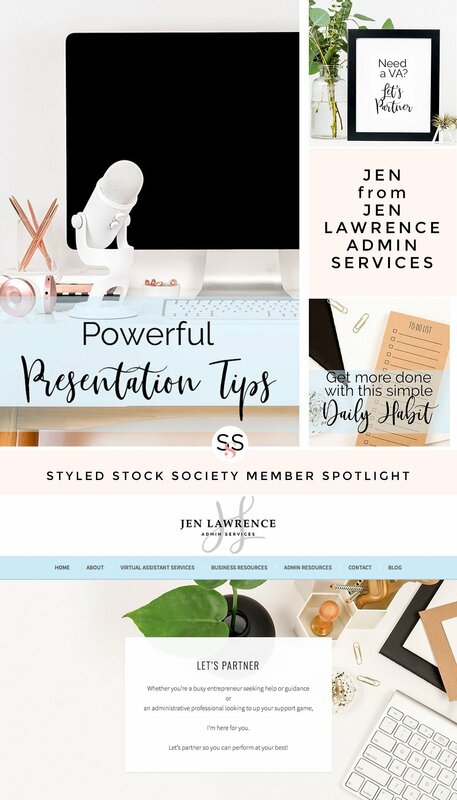 Jen Lawrence Admin Services is a virtual assistant business geared toward helping female entrepreneurs. I enjoy working with clients who are growing and starting to realize they can’t do everything on their own. And they shouldn’t be! That’s the true value of a VA – taking on all the “stuff” so you can get back to doing what you do best! I also write a blog focusing on professional development topics, such as productivity, networking, organization, communication, and more. 2) What’s one piece of advice you would go back and tell yourself when you were first starting your business OR what’s one piece of advice you would give someone else who is just starting their own business? Don’t get caught up in being “ready”. I had dreamed of being a VA for years but for many reasons, needed to stay in a traditional corporate job. I wanted to start my service as a side hustle but was worried that clients wouldn’t be keen on someone who wasn’t available during normal business hours. There were also a few things that I needed and wanted to get done – a logo, a blog, etc. I was bogging myself down with being “ready” – having all the time and resources in place. After mentally torturing myself over it for almost half a year, one day I just started writing and publishing blog posts. A few weeks later, I created a logo. Months later, I opened business social media accounts. Finally, I put myself out there with my limited hours and guess what? It worked out just fine. Moral of the story… don’t wait. Just start. Start anywhere and keep building. I love the variety of desk/office layouts. It nice to have a collection of consistently well-styled photos with a variety of colors. 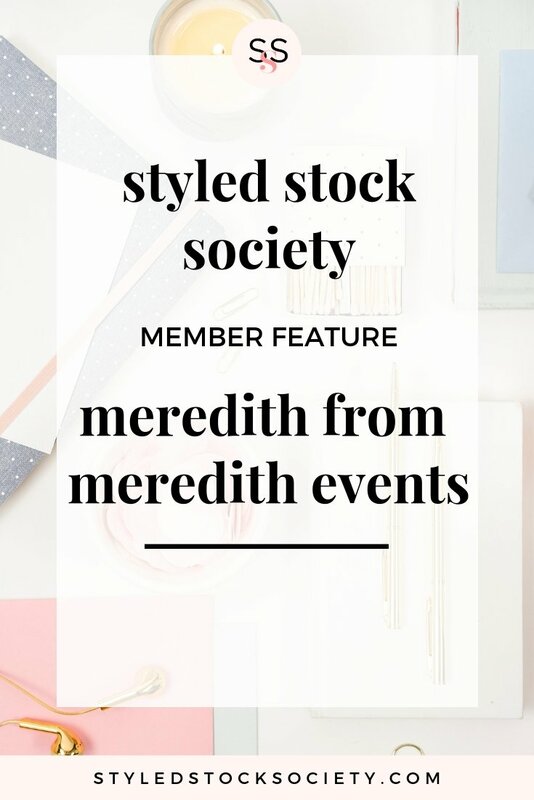 4) Tell us how being a Styled Stock Society member has made your life easier. I help women who are struggling to earn money grow their business with an automated, freedom based business model so they can have the lifestyle they desire. I help them implement my 5 step business model that runs automatically behind-the-scenes to attract the right people to their content, build the know/like/trust factor, and turn them into paying clients. Don’t try every strategy you find. It’s easy to get caught up in consuming content and trying every strategy you hear on a podcast or read in a blog post to grow your business. Choose 1 or 2 things that you really like doing, and your ideal audience wants, and focus your time and energy on those things. Showing up fully in 1 or 2 places will help you grow much faster than trying to juggle #AllTheThings. I’m obsessed with all the lifestyle collections! My website and Instagram are filled with photos from the Caffeinated Entrepreneur, Work From Bed, and Cozy Entrepreneur collections. This month we’re excited to feature Ashlee from She Can Social! I help female entrepreneurs grow their businesses online with custom social media strategies. I offer one-on-one consultations and social media management, and I’ll be launching a social media templates shop by the end of October! I’m passionate about helping female business owners make the most of their social media marketing. So many incredible women out there have the drive and determination to grow their business online, but struggle to find enough time in the day to do #allthethings. That’s where I come in! I take the guesswork out of social media marketing so that female bosses can focus on everything else that comes along with running a business. 2) What’s one piece of advice you would give someone else is just starting their own business? Stop focusing on what you should do and figure out what you want to do. Starting up a business takes a lot of energy, both mentally and physically. If you’re not throwing yourself into something you really like doing, it’s going to be 1000x harder to make it work. I love so many of them! But if I have to choose, it’s a toss-up between Cozy Entrepreneur and Pink on Marble. I drew so much inspiration from those two collections when creating the visuals for my brand and website. I also love to incorporate the Black + Rose Gold Desktop collection into pretty much all aspects of my social media identity. Who am I kidding, just gimme all the pretty pale pinks and I’m a happy gal! 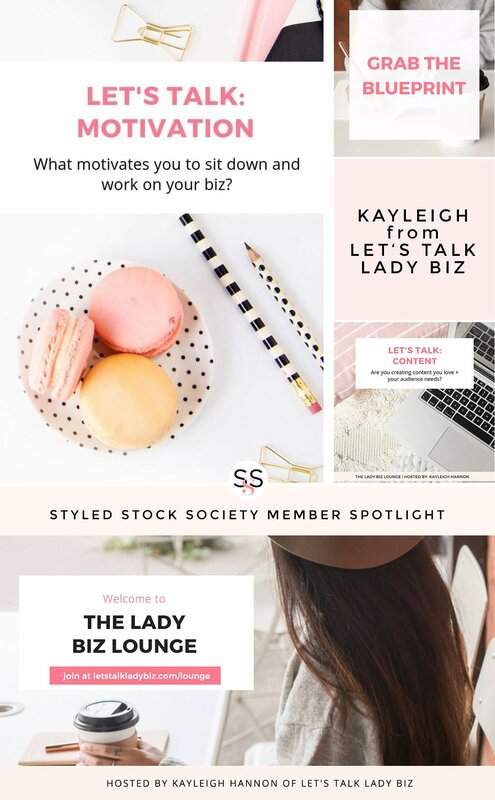 This month we’re excited to feature Tasha from Lady Boss Studio! 1) Tell us a little about your business / what you do! 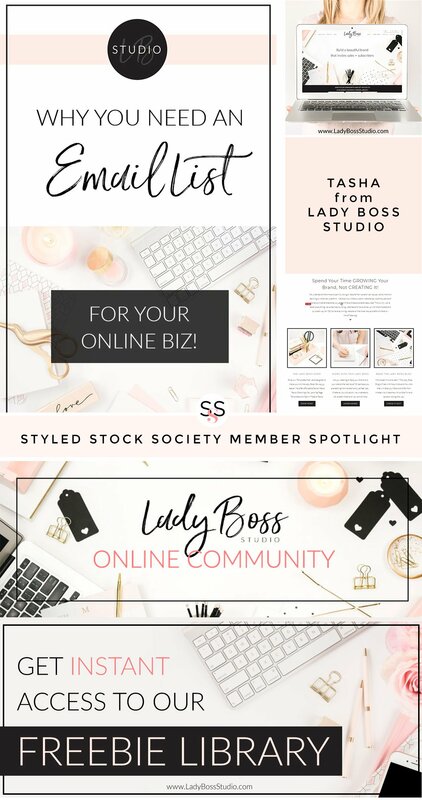 Lady Boss Studio is mainly a branding and web design business with a focus on feminine design. We also have an online shop that sells easy to use biz templates for Canva, Photoshop and inDesign. 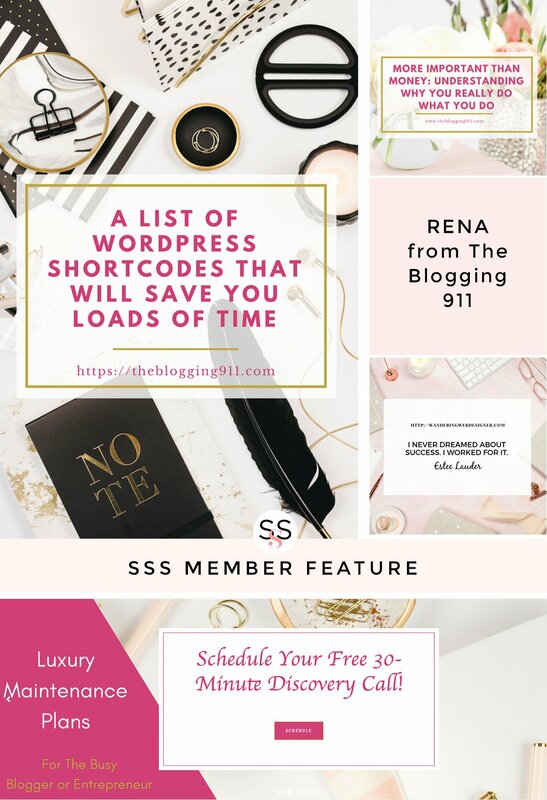 Lastly, we also have our blog which provides valuable information on topics such as branding, email marketing, WordPress tips, design tips, affiliate marketing and much more. Our services, products and blog are all geared to the female entrepreneur. As a mom of two, I wanted to create sort of a one stop shop for a lot of the goodies you would need as a female starting or running your own business. 3) What’s one piece of advice you would go back and tell yourself when you were first starting your business? The main piece of advice I would go back and tell myself is to really soul search and decide on exactly who my business is for and develop a brand and a business plan around that. I started out as a Virtual Assistant, which was a great start, but I had no real direction or ideal client that I wanted to serve. Having a more narrow focus from the beginning would have allowed me to progress further in my business a lot faster than I did. Although the pink and black desktop collection is near and dear to my heart since I use it as part of my main branding and it’s the first image you see on my homepage, my absolute favorite is your Fall Style Collection. Not only is fall my favorite time of year, but I’m IN LOVE with the actual styling in that collection. The use of the soft blush with the ripped jeans and black leather are on point! Who ever chose the outfits can come and be my stylist any day! This month we’re excited to feature Liz from Custom Convo! I’m a wife, mom, and entrepreneur. I run Custom Convo, a copywriting and content marketing service for female entrepreneurs. I craft website words for women. I spent 6 years as the in-house marketing director for a luxury brand, but decided to pursue a career with more flexibility when my younger son was born. I love working with other women who sought entrepreneurship to build a more balanced life. I specialize in writing website copy and ghostwriting blog posts for other female entrepreneurs. Be okay with growing slow! I tend towards perfectionism, so I can get bogged down in having all the details just right before I even get started. And especially when I compare myself to amazing women who’ve been in business for years, I get perfectionist paralysis…which just translates to procrastinating. 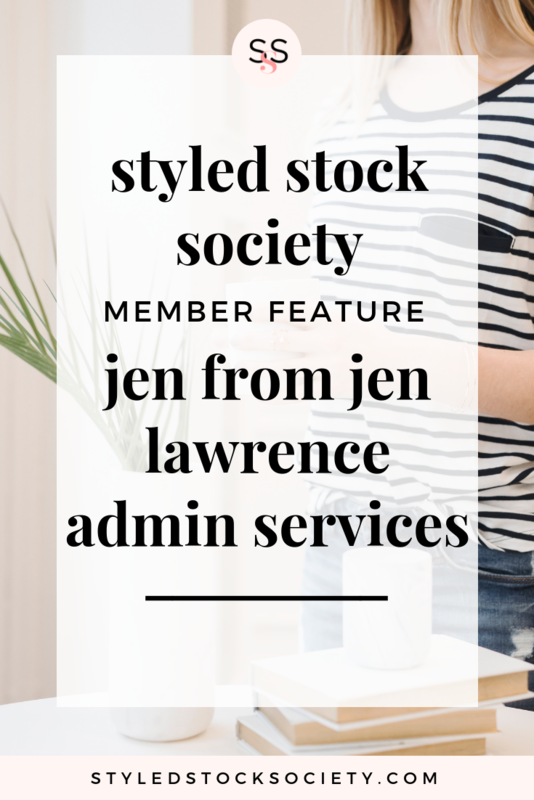 Joining Styled Stock Society right from the beginning gave me the confidence I needed to build a beautiful brand and just start while celebrating the milestones I’ve hit at my own pace. Fruit + Florals! My website is a love letter to that collection. I use it for all the major aspects of my visual brand, and it’s always a perfect fit. “I overlayed one shot from Fruit + Florals onto this pretty desktop closeup from Pink + Gold Desktop to countdown to my site launch. I love how easy it is to coordinate photos, even when they’re from different collections. I feel like I’ll never have to post the same image twice, and it makes it easy to customize photos to my brand palette.